Yes has announced its postpaid bundles for the Samsung Galaxy S6 and S6 edge, which it claims to be the absolutely lowest prices it can afford to charge. 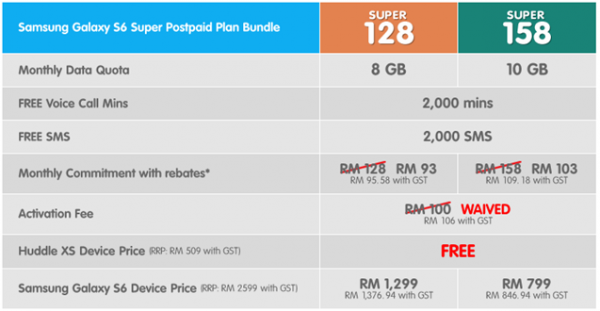 The Samsung Galaxy S6 Super Postpaid Plan Bundle will offer the Galaxy S6 for just RM799. Each Samsung Galaxy S6 will come with either the 24-month Yes Super 128 or 158 plan, which also includes a free mobile 4G Huddle XS mobile hotspot device. Customers subscribing to the Yes Super 128 will be able to buy the Galaxy S6 for RM1,299; although that price does not include GST. One the other hand, the Yes Super 158 plan offers the Galaxy S6 for the low price fo RM799, which also does not include GST. Yes is also offering the Galaxy S6 edge bundled with the Yes Super 158 plan for RM999. The press release does not say whether this includes GST, but the prices for the regular Galaxy S6 appear to indicate that the Yes Galaxy S6 edge will be subject to the additional 6-percent GST charge. Both the Galaxy S6 and S6 edge smartphones are available from Yes in white and gold colour variants, and customers will be able to pick up their Samsung Galaxy S6 Super Postpaid Plan Bundle from their nearest Yes Store or the Yes website. It should be noted that the Galaxy S6 edge bundle is only available through the Yes Online Store. On a similar note, the Yes website indicates that the bundles are already available through the physical stores today. Which is a little odd considering that the official release for the Samsung Galaxy S6 and S6 edge is tomorrow.